The old Hollywood classic All About Eve (1950) is still as fresh, sharp and witty as the day it was made. Above, the cast poses for a publicity still: they are (from left to right) Gary Merrill; Bette Davis; George Sanders; Anne Baxter; Hugh Marlowe and Celeste Holm. One of my favorite pastimes is going to thrift stores where I occasionally run across old Hollywood films. Recently, I picked up a copy of All About Eve, the 1950 Best Picture Oscar winner and probably one of the most brilliant films ever made in the Hollywood studio system. I've seen All About Eve at least a dozen times (it was a popular Saturday night feature when I was a kid), but I hadn't seen the film in four or five years. After my recent viewing, I came away with a new appreciation for writer and director Joseph L. Mankiewicz's masterpiece. I'll share a few things below that struck me while re-watching All About Eve. 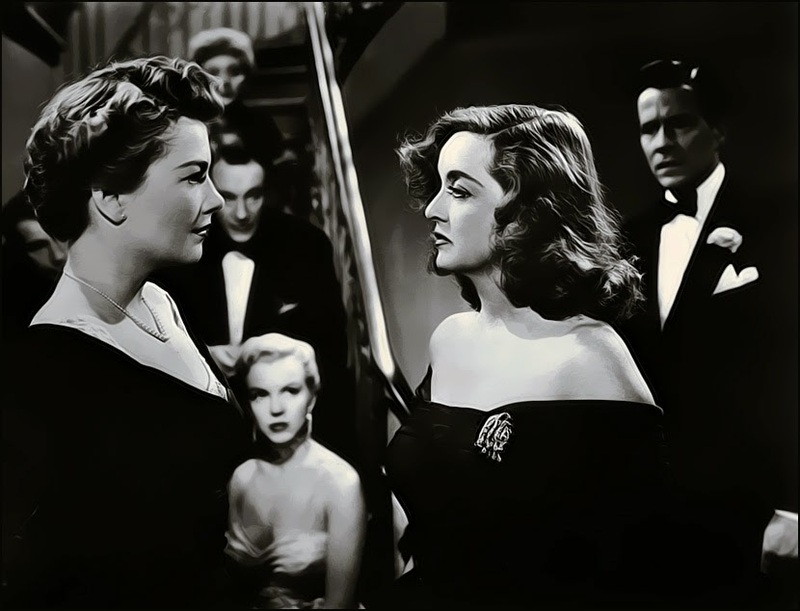 Anne Baxter and Bette Davis face-off in All About Eve (1950). 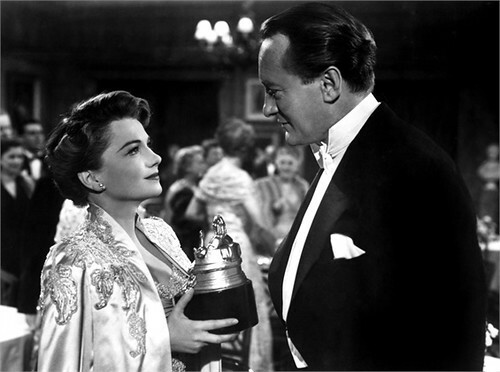 This is Anne Baxter's best screen performance: Baxter was already a well-respected actress by 1950 (she won the 1946 Best Supporting Actress Oscar for The Razor's Edge), but she is at her best in All About Eve as the wily and manipulative Eve Harrington. Baxter's Eve isn't just a two-faced liar: she has about 12 different personalities that she can shift to at moment's notice. For Margo (Bette Davis), she is the humble and adoring fan, merely content to be in the great diva's presence. For Margo's boyfriend and director Bill Simpson (Gary Merrill), she is a flirtatious minx. There has been some angst through the years about Baxter's Best Actress nomination (vote-splitting probably resulted in Davis losing the Oscar), but Baxter does have the lead role in the film (it's called All About Eve after all) and she is brilliant in the part. 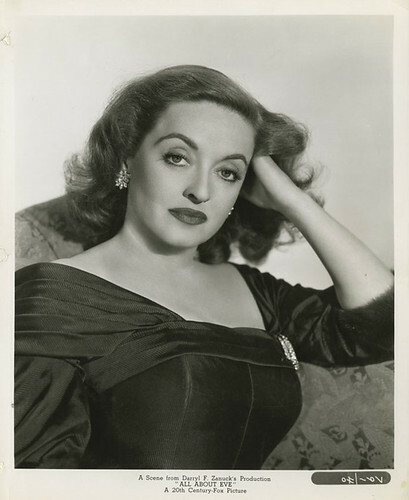 Bette Davis as Margo Channing in All About Eve (1950). All About Eve cemented Bette Davis' legend: Davis is such an icon today that it's easy to forget how bad her career was in 1950. Davis had once been the queen of Warner Brothers, winning two Oscars and appearing in box-office smashes like Jezebel (1938), Dark Victory (1939) and Now, Voyager (1942). Her fortunes had reduced considerably in the late forties, and she was appearing in second-rate fare like Beyond the Forest (1949). Everything turned around for Davis when she won the role of aging theater actress Margo Channing in All About Eve after Claudette Colbert, the first choice to play Margo, severely injured her back. Davis made the role of Margo all her own, earning a place in screen immortality by standing on a staircase and uttering the famous line, "Fasten your seatbelts, it's going to be a bumpy night." Addison DeWitt (George Sanders) congratulates Eve Harrington (Anne Baxter) on her Sarah Siddons Award in All About Eve (1950). The first scene lays out the whole picture: Mankiewicz wrote a brilliant screenplay for All About Eve. The first scene, which features Eve receiving the prestigious Sarah Siddons Award, sets up the entire film, which is told in a series of flashbacks. Theater critic Addison DeWitt (George Sanders) narrates the opening scene, and his acerbic one-liners, along with some magnificent acting by the cast, let the audience know not only who's who, but who despises who. The audience gets quite a bit of information in about five minutes screen time (Eve is the master of the humblebrag; Margo's theatrical history; Addison's egotism: Celeste Holm's epic side-eye when Eve wins an award). 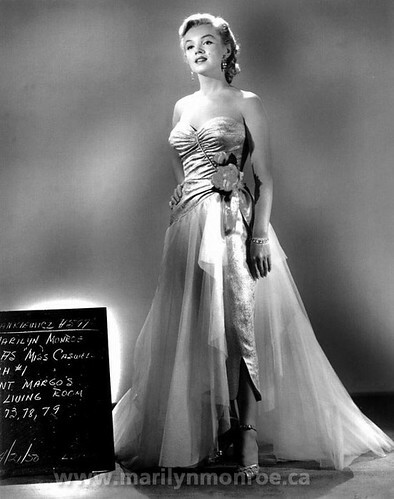 Marilyn Monroe in a costume test for All About Eve (1950). Marilyn Monroe is pretty good here: I remembered Monroe's part as a walk-on, but she actually has a substantial cameo and she's really quite funny. She plays Miss Casswell, a chorus girl who is arm candy for the ever-egotistical DeWitt (at one point he wryly notes that Miss Casswell "graduated from the Copacabana school of the performing arts"). Monroe makes quite a good impression in the famous party scene (she manages to standout among all of the showboating that is going on around her) and she delivers a couple of very funny lines ("why do they all look like sad rabbits?"). 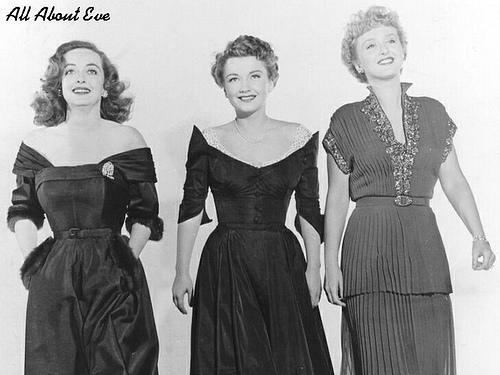 The three leading ladies of All About Eve: Bette Davis, Anne Baxter and Celeste Holm. Celeste Holm is a revelation: Like Baxter, Holm was a well-respected actress in 1950 (she won the 1947 Best Supporting Actress Oscar for Gentleman's Agreement). Holm probably has the least showy role in All About Eve, but she turns in one of the film's most effective performances. She plays Karen Richards, the wronged wife of playwright Lloyd (Hugh Marlowe). Karen is only involved with the theatrical crowd because of her marriage, and she is by turns amused, irritated and befuddled by their outrageous antics.